A newspaper announcement published in The Oviedo Voice on September 16, 2004. 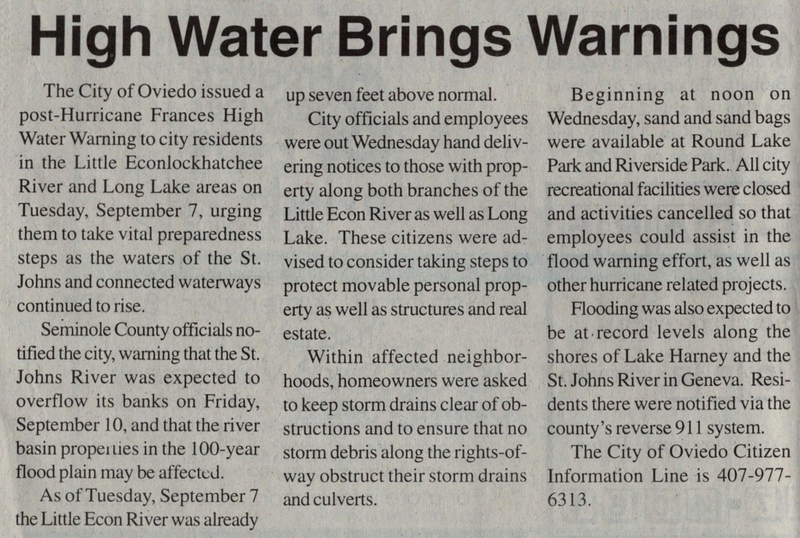 The article states that the City of Oviedo had issued a High Water Warning in the aftermath of Hurricane Frances, which hit Central Florida in early September of 2004. Frances caused damages exceeding that of Hurricane Charley, another hurricane that hit Florida the previous month. 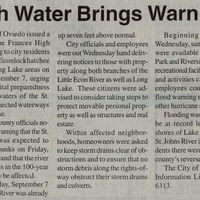 Original newspaper article: "High Water Brings Warnings." The Oviedo Voice, Vol. XIV, No. 38, September 16, 2004, page 1: Private Collection of Edwin White and Carolyn White. Digital reproduction of original newspaper article: "High Water Brings Warnings." The Oviedo Voice, Vol. XIV, No. 38, September 16, 2004, page 1. Originally published by The Oviedo Voice. "Coastal Change Hazards: Hurricanes and Extreme Storms." U.S. Geological Service, U.S. Department of the Interior. http://coastal.er.usgs.gov/hurricanes/frances/. "Hurricane Frances’ Fury." PBS NewsHour. http://www.pbs.org/newshour/bb/weather-july-dec04-frances_9-06/. “High Water Brings Warnings.” RICHES of Central Florida accessed April 25, 2019, https://richesmi.cah.ucf.edu/omeka/items/show/6332.